The Ararat brand has long been associated with art, no wonder it has recently become the official partner of the legendary L+S Theatre in Slovakia. Art however, is not merely a vehicle to bring you fame and fortune, although it most certainly does. It can sure be found in a unique recipe perfected with surgical precision resulting in an unprecedented taste. The legendary spirit is not the only masterpiece here, the chocolate brand LYRA also springs to mind, the brand that is starting to build a closely tied relationship from now on with the Ararat line. The Armenian brandy Ararat definitely has what it takes to smoothen each exceptional occasion and being paired with LYRA chocolate makes those unique moments truly unforgettable, just what the doctor ordered. Only those who already tasted the Ararat line brandies fully appreciate the remarkably delicate taste highlighted by the highest quality chocolate. „We are excited that Ararat has entered a relationship with such an exclusive chocolate brand, handmade using only the highest quality ingredients. We are absolutely confident that just like the way the Armenians take pride in Ararat and justly so, we can also pride ourselves on the exclusive chocolate LYRA made in Slovakia, the two make a perfect pair, just no question about it,“ Matúš Kollár, the Ararat brand manager added. 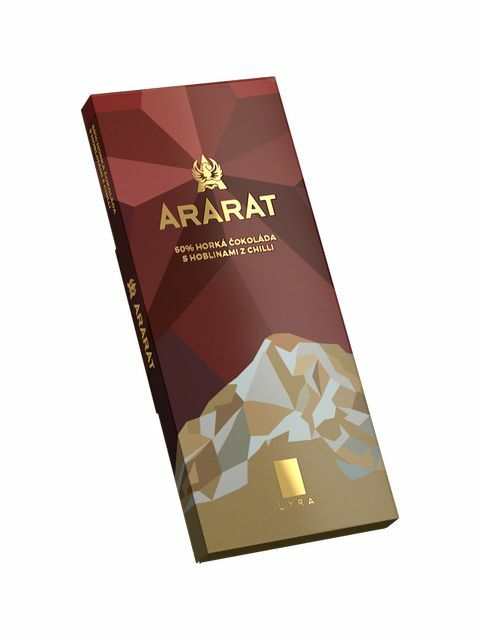 Ararat Akhtamar aged as long as 10 years has long been enjoying unabated popularity by true gourmets and is highly appreciated for its accentuated sweet final tone of plums and walnuts along with a distinctive hint of beeswax. This experience gets even better when the spirit is paired with LYRA quality bitter chocolate with the cocoa content of 60%, spiced up with chili pepper bringing you the ultimate culinary adventure. Fans of both brands will get the chance to taste the branded Ararat chocolate that comes with the legendary brandy throughout October in select points of sale. This unparalleled combination will definitely hit the spot if you love chocolate and brandy, but even if you don’t, your taste buds will prove you wrong, guaranteed. The ancient musical instrument lyra served as an inspiration to the producers of the chocolate who embarked on a mission to reach an unforgettable coexistence of flavors, you will highly appreciate every single time you have a bite. They definitely did manage to achieve the goal they set for themselves, numerous awards received in just 8 short years stand as proof of it: Great Taste Awards for LYRA MANDALA in 2014, the best product design award in 2015. LYRA addresses all your senses, that is for sure. The quality is guaranteed by every single bar being handmade using only quality ingredients and natural sweeteners doing no harm to your health. The cocoa comes from local farmers in Columbia, Dominican Republic and Peru carrying the mark of “Fino de aroma”, the mark of excellence, a mere 6% of the world cocoa production can boast of. The LYRA recipe is OCD style detail oriented and the brainchild of Karol Stýblo nominated for one of the four best masterchef chocolatiers in the world! „The LYRA chocolate is made with the maximum effort to build perfection taking it to a whole new level. We are absolutely confident that our effort will be appreciated by all those who prefer quality above all. So we are extremely glad that we can cooperate with a brand that is the mark of quality by itself, the Armenian brandy Ararat, “Karol Stýblo shared his opinion.